Because of the highly effective energy-producing properties of electric motors, they have become an essential component in today's mechanical and industrial drive applications. Most power transmission (PT) applications today are actually powered by electrical motors. Our plethora of electric motor options not only make it easy to find the exact motor you need, but also give people the ability to compare and contrast motor types and performance factors when in the replacement, updating, or even engineering stages of a project. As one of the largest Power Transmission distributors, USA Roller Chain & Sprockets is able to offer premium efficiency electric motors at highly competitive prices. We also have teamed up with select motor shops for electric motor repairs and rewinding. Essentially, the basic purpose and functionality of an electric motor are to convert electric energy into mechanical energy to be used for rotational force. A standard electric motor will consist of a rotor, bearings, stator, air gap, windings, and commutator. The rotor is essentially the moving part of the motor which turns the shaft, it will usually have conductors laid into it to carry currents thus interacting with the magnetic field in the stator to generate the force that will in-turn rotate the shaft. But some rotors will have permeant magnets which leave the stator to hold the conductors (in this type). Electric motors can be powered by both direct current (DC) and alternating currents (AC) This is much cleaner and efficient than using other means of energy such as natural gas. 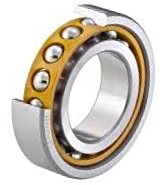 The bearings in an electric motor are used to support the rotor and allow it to turn on its axis. Which the housing in-turn supports the bearing or bearings and the shaft where forces will be applied is extended through the bearing. The stator is the stationary portion of the motors electromagnetic circuitry and will in most cases consist of magnets or windings. The core of the stator consists of thin metal sheets that will later reduce energy losses versus a solid core. The air gap represents the distance between the rotor and the stator. Unsurprisingly, the air gap plays major importance when it comes to an electric motors performance. The larger an air gap is a more magnetizing current is needed, and there is a threat of having noise as well as mechanical problems. Because of this, most manufacturers aim towards making this as small as possible. Windings are the wires that are laid in coils around a laminated soft iron magnetic pole. This creates magnetic poles when energized with a DC or AC current. There are two primary pole types used in the industry and they are "salient-pole" or "nonsalient-pole". The salient-pole configuration is where there is winding around the pole below the face. For the nonsalient-pole (distributed field or round-rotor) the winding will be distributed in pole face slots. 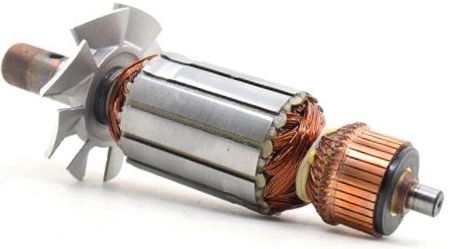 A commutator is used for switching the input of most DC motors and certain AC motors consisting of slip-ring segments insulated from each other and from the motor's shaft. The armature current is supplied through the stationary brushes that are in contact with the revolving communicator thus causing the required current reversal, which applies power in the most optimal manner as the rotor rotates from pole to pole. Not only do we supply new electric motors but we also offer motor repair and servicing throughout our strategic partnerships made with motor shops. On a local basis, we have effectively partnered with repair facilities in Florida, Tennessee, Mississippi, and Kentucky. However, we offer freight services to and from these shops nation-wide. In basic terms, electric motors take electrical energy and convert it into mechanical energy through the interaction between the motors electric field and the current going through the windings. As stated above the power supply can either be direct current (DC) or alternating current (AC) that goes into the motor. The theory of electric motors spans all the way back to the 1740s, but it wasn't until 1821 that the very first example of effective rotary motion was produced by a free hanging wire dipped into a pool of mercury with a permanent magnet placed on the mercury. Once electricity was passed through this wire, it proceeded to rotate around the magnet which showed that the current produced a close circular magnetic field around the wire. By 1827 experiments began with these devices and were called "electromagnetic self-rotors" and by 1828 the very first device was made the contained the three main components of today practical direct current (DC) motor, and the device contained no permanent magnets because the magnetic field was both the stationary and revolving components that were produced solely by the currents flowing throughout the windings. In 1834 the very first "real" electric motor was mad and developed remarkable mechanical output power. Then another motor was produced with an improved design in 1838 that was powerful enough to drive a bot with 14 people in it across a wide river. However, the first DC motor that was capable of turning machinery was invented in 1832 and by 1837 was improved upon and patented. These motors were capable of producing 600 revolutions per minute (RPM) and powered machine tools and printing presses. However, due to the high cost of battery power motors became commercially unsuccessful. A major turning point for DC motors came in 1864 when an inventor first described the ring armature which symmetrically-grouped the coils closed upon themselves and connected the bars of a communicator which the brushes would deliver a practically non-fluctuating current. This led to the first commercially successful DC motor development in 1871. Then in 1872, the drum rotor was introduced which further improved the efficiency and in 1873 the laminated rotor was introduced which reduced iron losses and increased induced voltages. Furthermore, in 1880 the rotor was provided with slots for housing the winding, further increasing the efficiency. The first practical DC motor was produced in 1886 and was a non-sparking motor that maintained relatively consistent speed under variable loads. Due to additional inventions, the power from DC motors was allowed to be returned into the electrical grid, this provided electrical distribution to trolleys via overhead wires and the trolley pole, and also provided control systems for electric operations. This inversely led to the invention of the electric trolley system in 1888, an electric elevator and control system in 1892, and the electric subway station in 1892. In 1824 the existence of rotating magnetic fields was formulated by manually turning switches on and off and wasn't demonstrated until 1879 as in effect the first primitive induction motor. In the 1880s many inventors around the world were attempting to develop a workable AC motor because of the advantages of AC from long distance high-voltage transmission, but this was offset by the inability to operate motors on AC. By 1885 the first alternating current commutatorless induction motor was invented, and improved upon in 1886. In 1887 the envisionment of possible industrial development was made, and the induction motor was patented in 1888. By 1891 AC motors were used to power a mining operation and by 1892 the development of practical polyphase 60-hertz induction motors was achieved and in 1893 they were introduced as two-phase motors with wound rotors. However, cage-rotor and wound rotor three-phase AC motors were invented in 1889 with a starting rheostat, and a three-limb transformer became available in 1890. Lager models of these motors were then produced, a 20 HP squirrel cage and a 100 HP wound rotor with a starting rheostat. These were the first three-phase asynchronous motors suitable for practical operation. Since then, similar developments of three phase machinery was started and in 1894 the first long-distance three-phase system was successfully presented. It was rated 15 kV and extended over 175 km. By 1896 General Electric and Westinghouse signed a cross-licensing agreement for the bar-winding-rotor design, later called the squirrel-cage rotor. Induction motor improvements following these agreements led to innovations and improvements such that today, 100 HP induction motor has the same mounting dimensions as a 7.5 HP motor in 1897. The invention of AC and DC electric motors lead a key roll in the American industrial revolution as well as development for other countries and consume more than half of the electrical energy produced today in The USA.